Aerial Yoga. What's the big deal? It's the hot new thing....but is it just a fad? If you know me, you know that I'm pretty grounded. I believe in the power of yoga to transform us into our best selves, and it works in the simplest of ways by asking us to slow down and focus. It helps us discover who we really are and surrender to that truth so we can live from a place of authenticity. I don't need "the hot new thing," but I do want to create a space that provides a variety of options to meet our diverse community's needs. I've had many requests for aerial yoga right from the start, and I admit I've been intrigued as well. In my quest to learn more about this way to practice yoga I've learned so much! I've discovered that the silk hammock, like any prop, can be a powerful tool and a tremendous therapeutic aid. I decided it was worth pursuing, researched available trainings, and found a variety of options. Some of them come from the entertainment industry, some from the yoga tradition, and others are a combination of the two. Most are privately run. Some, like Unnata® and AIReal Yoga™ are beginning to create brands for themselves. AIReal Yoga™ even goes so far as to claim to be "the first and only brand of aerial yoga accredited by Yoga Alliance." And it's true. They have the only accredited training that is branded. Their training is not the only one accredited by Yoga Alliance though; according to Yoga Alliance they are one of many. Here’s the thing: the only reason to create a brand is to commoditize a product. In this way, businesses maximize their bottom line as they spread their brand across many markets. When you create a commodity, you must ensure consistency among those delivering your brand. In the case of yoga, it means creating set sequences following specific rules dictated by the creator of the brand. 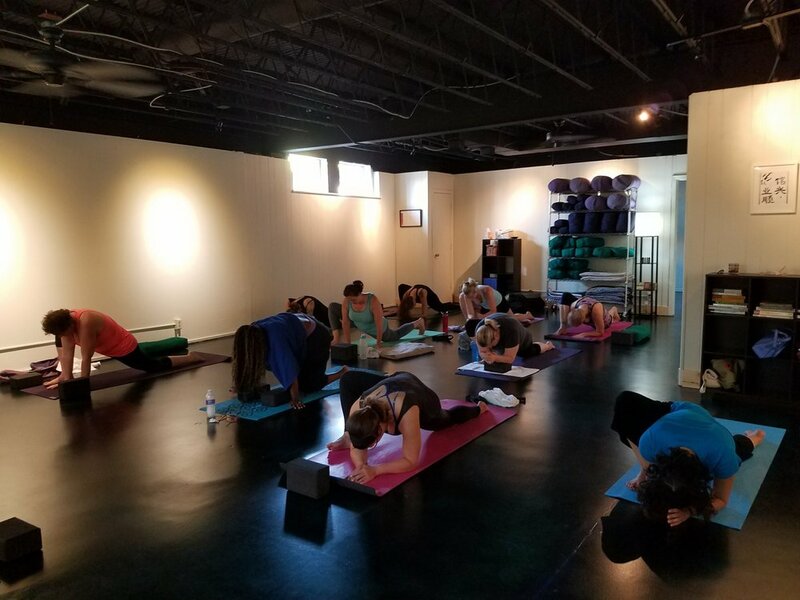 Studio owners lose their abiltiy to adapt, and the yoga they teach is “one size fits all.” When mass produced and delivered, the real practice of yoga is secondary to the achievement of economic gains. More and more yoga is being sold this way. Corporations have been spreading across the U.S. for years, selling templates to teacher trainees who want to deliver cool workouts to the uninitiated. Aerial yoga is beginning to jump on the bandwagon. What’s meant to be an internal practice leading us to our truest, brightest, selves is instead a competitive standard for students to gauge themselves against. Over many years of practicing and teaching I've learned that real people are NOT "one size fits all." They come in all ages, shapes, sizes, and fitness levels. They come filled with all the realities of life - joy and sadness, truimph and defeat, getting it together and falling apart. It’s my passion to hold space for everyone so they can explore their bodies, minds, and spirits in an environment full of support and encouragement. With all of this in mind, my path led me back to the teacher/student model of yoga: one on one focused engagement. I've been pursuing this avenue so we can add aerial yoga to our other offerings at KC Yoga Kula. We're excited to announce regular classes beginning May 8th! Plus: Aerial Yin Yoga on select Sunday afternoons. The first one is scheduled for Sunday May 27th at 4:30 PM. Aerial Yoga at KC Yoga Kula is real yoga, adaptable to real people. It’s not a brand. It never will be. No worries if aerial yoga isn't your thing! We have a variety of classes 7 days a week and offer weekend workshops on topics of special interest. We always have tea, so we can sit (and sip) together while we build our community! Join us and find your OM!